When entering a library, one expects a calm, quiet atmosphere. Maybe a few hushed voices and the occasional sound of books being stacked on a counter. As I entered the Lopez Island Library last Saturday, the environment was a cross between a circus and a concert. When I first became acquainted with the Lopez Island Library, one of the most interesting facts to me was that the library checks out musical instruments – just like they check out books. So, when I heard about the 2nd annual Musical Petting Zoo at the library, I knew I had to go. Once again, I was reminded why this library is unique (and nationally recognized). The Lopez Library is more than just a hub of information; it’s a gathering place, a classroom, and a catalyst for bringing new perspectives to this island community. The Musical Petting Zoo was created to showcase the library’s unique musical instrument lending program, which makes available, for one-month, fourteen different types of instruments – from guitars to electronic keyboards to French Horns. That collection continues to grow through donations from the community. 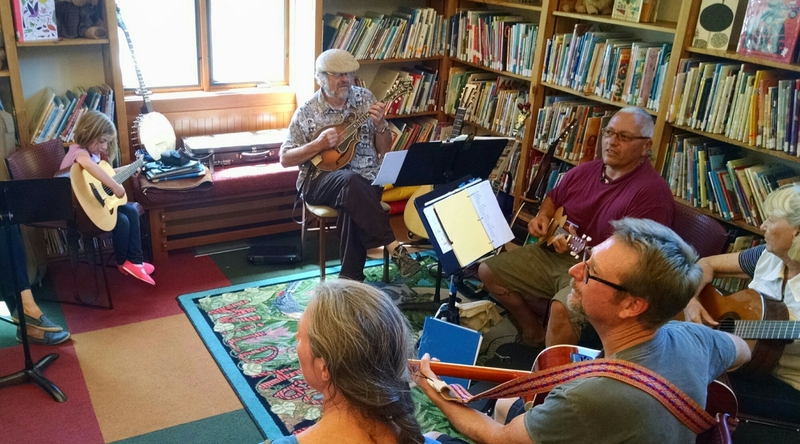 One reason for the library’s music focus is that, compared to other communities, there aren’t as many kids learning how to play musical instruments on Lopez. On Orcas Island, nearly half the kids in 5th and 6thgrade play some kind of instrument. “Lopez could use more vitality in music,” according to one parent I met at Saturday’s library event. Based on the number of kids I saw having fun with instruments at the library, there seems to be an appetite for music among young people here. The challenge is that musical instruments can represent a large investment for families. Having a chance to “try before you buy” makes it a lot easier to investigate what musical skill you want to develop. There are scientific studies to support the argument we should invest more in music for kids. Neuroscientists have found that playing music engages every area of the brain – contrasted with reading, doing math, creating art or playing sports, which correspond to very specific brain areas. Playing music is the brain equivalent to a full body workout. These same scientists have determined that musicians tend to be better problem solvers, with higher levels of strategic thinking, planning and attention to detail. This TEDx video summarizes the science nicely. I’ve decided I need to learn how to play a musical instrument. Beth reminded me that it’s important for parents to model what they want to see in their kids. Growing up in Chicago, Beth was a “bando.” When her son Tim was thinking about learning the French horn, she knew she couldn’t expect him to do that work if she didn’t practice right alongside him. So, after a 20-year break from playing a musical instrument, Beth decided to learn the Tuba. Soon after that, she was joined by her husband, Matt, on the trombone. Daughter Leah soon followed on the bassoon. They now play together in a community band. When they were asked to help advocate for music on Lopez, they immediately agreed. 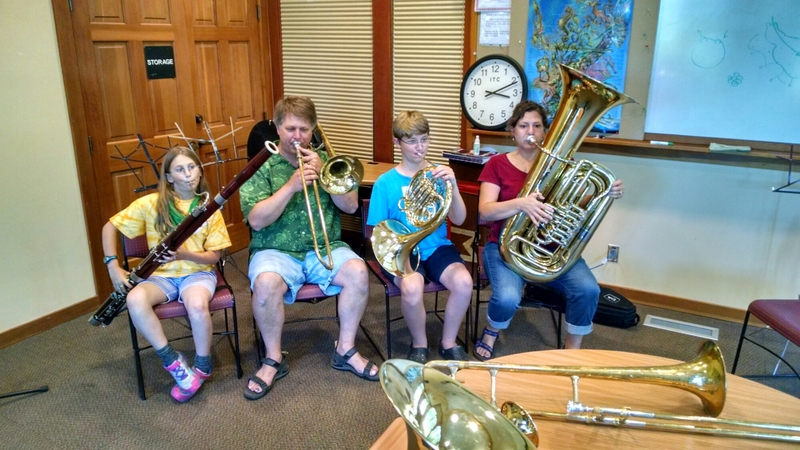 It was fun watching all four members of the Jenson family – not to mention about a dozen other volunteers – instruct young Lopezians on the basics of holding and playing various instruments in the library’s different rooms. Both my kids got into it. My six-year-old daughter sat in on the guitar circle for several sets. My eight-year-old son spent most of his time in the wind section. I was even happier about that after Beth informed me that learning the French horn almost guarantees some kind of scholarship in Washington State, due to the small numbers of kids in the state playing horns. 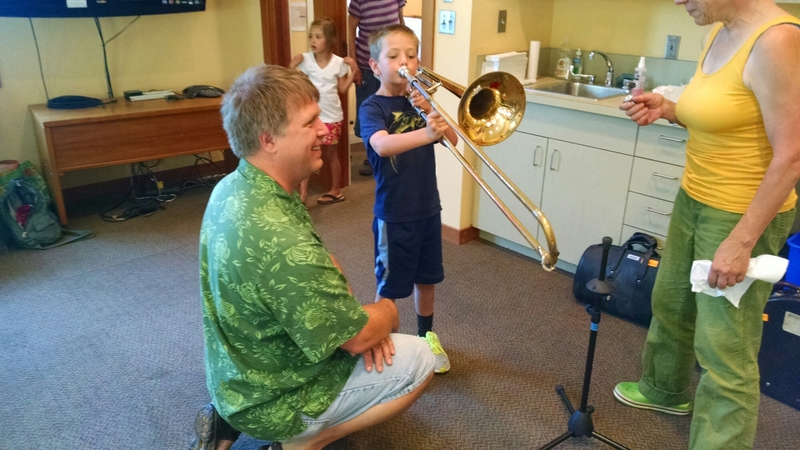 After attending the Musical Petting Zoo, my family definitely plans on taking advantage of the library’s musical instrument lending program. I encourage other Lopezians to do so, too. All you need is a library card. And a brain that’s ready for a little workout. 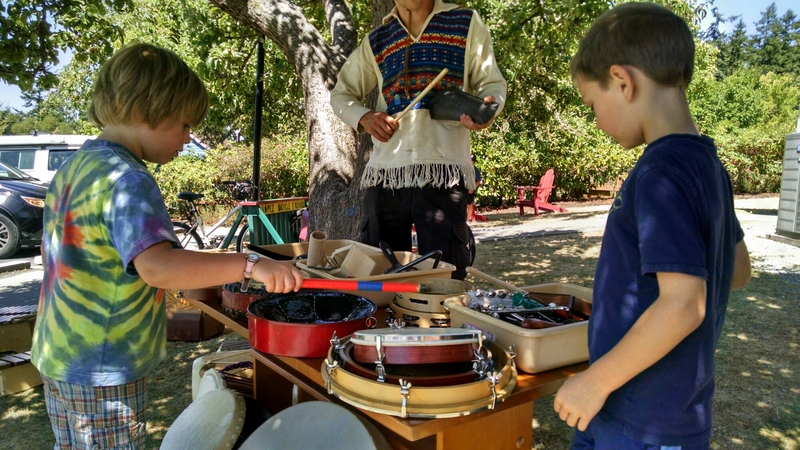 Being at the Musical Petting Zoo was a special event of our visit to Lopez Island. Music is important food for the brain. Nurture the brain with music!